These African winnowing baskets represent the pinnacle of design and execution for this type of basket. Woven in Tonga from natural palm leaves, these light and beautiful baskets look great decorating a wall. You will receive the exact basket pictured above. 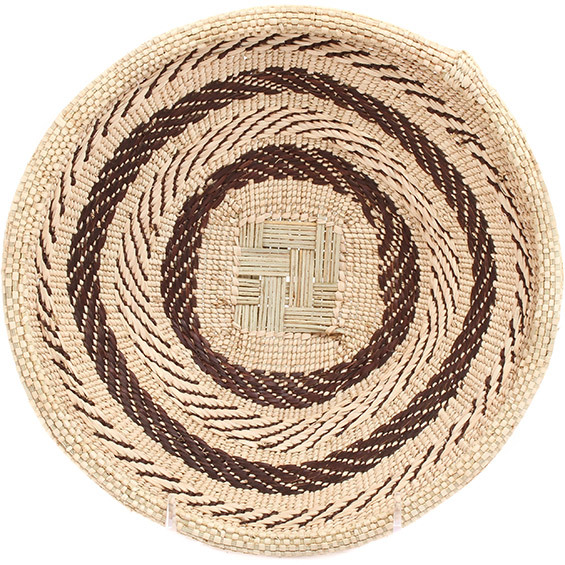 This Tonga basket is named for where it is woven, the Binga district of Zimbabwe. In the early 1960's, the fertile lands of the baTonga people were permanently buried in water during construction of one of the largest man-made lakes in the world, Lake Kariba, and the people who lived there were forced to relocate to the Binga district. Tonga baskets are woven on radials of 'creepers' (vines), and palm leaves are sometimes dyed with bark and roots to make up the designs. These baskets were traditionally used for winnowing maize. These baskests look amazing as wall decor. Copyright 2002 - © Baskets of Africa / Cael Chappell, all rights reserved.